2 years ago, a month before my birthday, I got a surprise email from a dear friend whom I’ve been working with since 2010. I was told that he has got tickets for 2 to a 3d2n cruise to Redang in April 2013. Due to unforeseen circumstances, both him and his partner aren’t able to make it for the trip. So he asked if I am interested and would like to go instead. It has all been paid for and I just need cash for my own expenses or other additional paid activities. I was very stunned and thought it was all a dream. I asked if he was serious about it and he replied within minutes saying it is indeed. We had a few email going back and forth and everything was settled once he gave my details to them and he confirmed the dates of my trip. I was over the moon. Never had I once imagined I could be this lucky. BUT! Sadly my passport was due to expire in less than 6 months. And Star Cruise has a strict rules & regulations that all visitors must require to have a 6 months passport validity. My friend was as upset as me and he actually went all the way to ask if there’s anything we could do about it. The 2 involved party mentioned that we could try to request for urgent renewal of my passport. So I call up ICA and informed them of the situation. I was told that it may be done but I needed a few documents from the involved companies and that I can only request for an urgent renewal once in my life. Rushed to ICA upon receiving the necessary documents and got my passport renewed within a day. It was awesome. We could finally breathe. I thanked him again and again and mentioned that this was one of the best advanced birthday gift ever! Yes! This trip was a few days prior to my big 25, a quarter century if I were to live a 100 years old. I felt truly blessed. So, here you go! Let’s flashback to 5 – 7 April 2013. Our cruise are bound to depart on Friday, 5th April 2013 at 8pm. But we needed to check-in by about 6pm if I’m not mistaken. And this is cool! Why? Because this meant we could see sunset on a cruise! By now you should have noticed how much I love sunset. Generally most people does too. Who doesn’t, right? 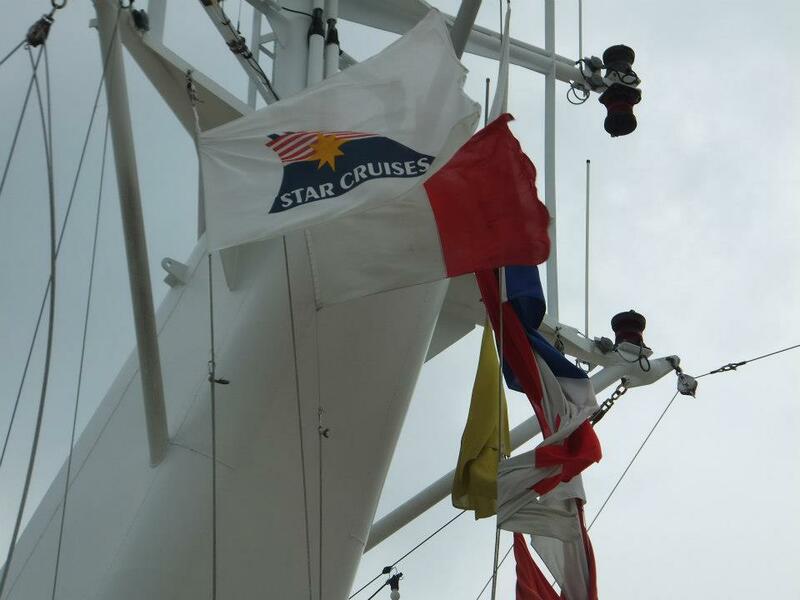 Star cruise check-in counter is located at HarbourFront Singapore Cruise Centre, level 2. It was fuss-free and I wouldn’t say very efficient. Cause on that day, there seems to be a few new staff so the process wasn’t pretty smooth. However, overall service was considered okay. Once our passport was successfully checked, I had to control my excitement. 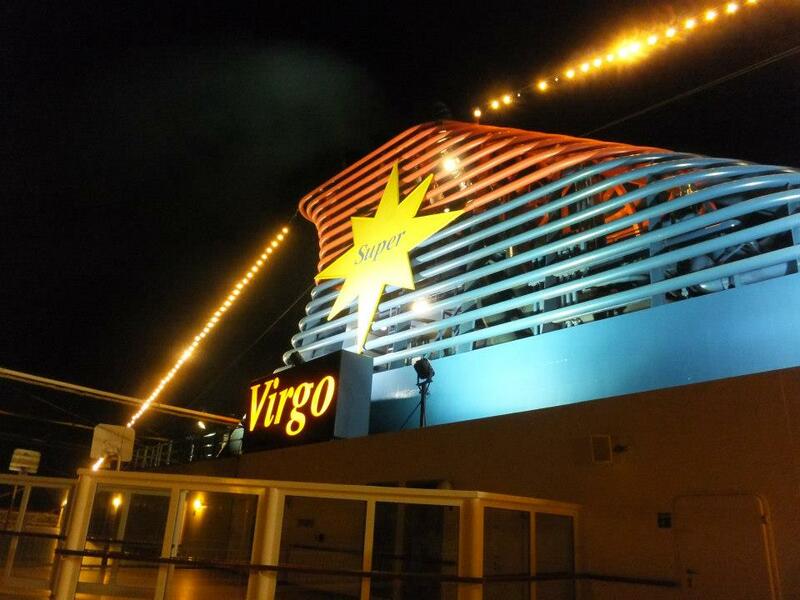 We had to walk in to where our cruise was docked and before the entrance of the cruise, Superstar Virgo staff awaits us to do 1 last passport check and as we enter the cruise, another group of staff were there to issue our room card. All balcony class was treated as a priority. They hold on to a red room card with $100 value inside while the rest of cabin class rooms receive a blue room card with no value. The interior of the ship was very classy. I love the bubble transparent glass elevators and the balconies of the restaurants. I didn’t realise I was actually standing at ‘The Grand Piazza Atrium’ for more than 10 minutes, just looking up and observing the designs and everything I could see from where I was. It was so much like a 5* hotel. I couldn’t sit still so I decided to explore the ship. We explore the outdoor deck 12 where the Mediterranean buffet is, the swimming pool and a live band preparing for their performance. I love the Sun Deck most. Here, you can let your hair down and feel the wind in your hair. It’s right at the top, an open space where you can find the helipad, jogging track and sports deck. This is where we could see Sentosa gateway and the resorts world Sentosa with the cable car linking to it. 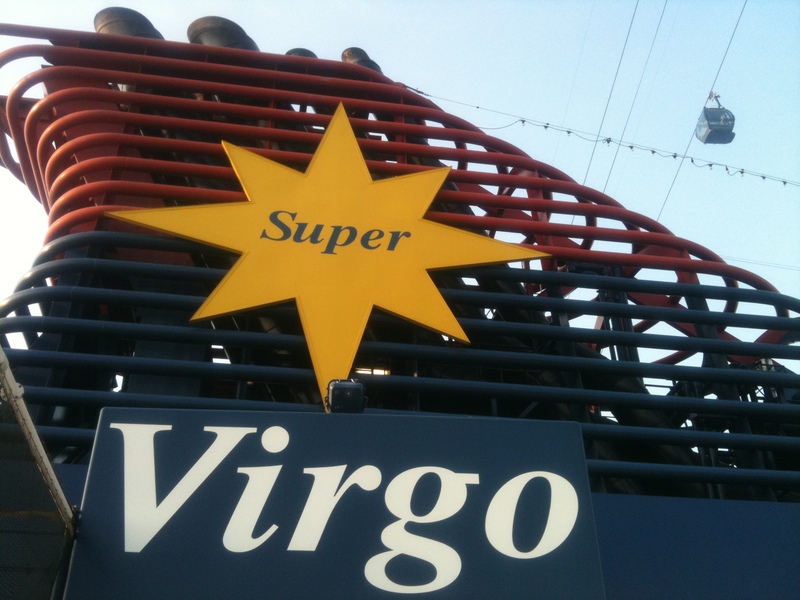 And of course, the Sun Deck was the most awesome deck to view Sunset! And this is where you can be like ‘Rose and Jack’ in the Titanic movie where Rose had her arms spread wide open as Jack hug her from behind. Awe… romantic much. We had to assemble at Deck 7 for a short briefing on the safety procedure should anything happens during our journey. It was a good briefing indeed. Being a Muslim, getting halal food will not be a problem here. You can have your meals over at the Mediterranean Terrace, an International Buffet where its free most of the time or The Taj, a halal indian buffet, where you have to pay for it. We had our dinner at The Taj, utilising our free 1 time meal voucher we got earlier on. The food is good. The ship has just began to set sail to our port of call, Redang, where it’s due to reach by tomorrow morning. I love the ambiance. All chirpy, hyper and it was pretty cool with the night sea breeze as the ship sail through South China Sea. We played Bingo! And have no luck in winning any of the 4 coupons we had. We spent some time exploring the activity centre where there’s arcade, library and many more. Before going back to our cabin, we explored Sun deck again. This time, we sat down, watch the stars in the dark sky and just have a few moment of silence, taking in the moment of peace and serenity around us. Rise early to watch sunrise but couldn’t catch it. The bed was too comfy and the room was too cozy to leave. Perhaps we might get a chance to watch sunrise tomorrow. As I look out the window, I smile, then close my eyes and felt a tinge of happiness to be able to wake up in the middle of an ocean. Had our breakfast at about 9am at Mediterranean Terrace. We were late so most food were gone by then. We got muffins, cereals, hotdogs and eggs with bread n soup which is more than enough actually. While awaiting for our ship to reach Redang, we explore the other side of deck 12 where the observatory is located. This is the place to observe the surroundings of where the ship is going. There’s also ‘The Den’ where you can see the Captains working and the layout of the Superstar Virgo Cruise in a mini display as well as the ‘Hall of Fame’ and history of the ships here. The ‘Galaxy of The Stars Lounge’ is where activities are held and everyone are welcome to participate. Last night, we booked an excursion to Pulau Redang. If I’m not mistaken, it cost about $37 or $47. I know it’s below $50. We took up the cheapest excursion where it’s just for snorkeling. They will charge the amount to your card where you’ll settle the bills later. When the Captain announced that we’ve reached Pulau Redang, I almost jumped for joy. Finally I get to be on the beach! We were told to assemble at the Lido at about 10am. Some visitors chose to stay on the cruise while others who have booked for the excursions are eagerly waiting at the Lido for our turn to be transferred to a smaller boat where it will bring us over to Pulau Redang. We were given red stickers with 11am time so that we can all identify our group members. 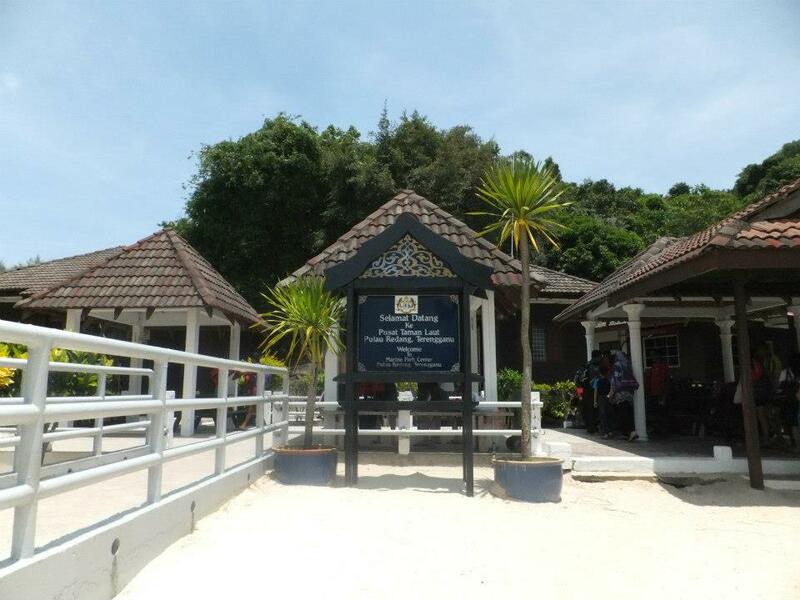 The boat ride takes about 10-15 minutes to reach the shore of Pulau Redang. It was obvious that all of us can’t wait to explore the Island. Almost everyone had their camera snapping away photos while still in the boat including me. It was a great sunny weather where the skies are blue, windy and the water was shining like a diamond. The welcome board. The first thing we had to do was register and collect our snorkeling gears here. While queuing, I was busy snapping away photos after photos. When I look at the map at ‘You are here’ and saw that we are near to cemeteries, I pray in silence for them. We found a spot on the side of the Jetty, setttled down and snorkel for more than 2 hours. We were both enjoying snorkeling till we didn’t even keep track of time. It was my friend’s first time snorkeling and I love watching people react on their first try. He kept on looking at me and go, “Fish!” It was a very memorable moment. We ensure that we stay close and don’t stray too far away from the lines. As usual, the further you go, the better the life under water is. However, I notice that there were many dead corals. It’s really sad. The visibility was just average. I bought a cheap film camera at HarbourFront Centre and use it for the underwater photos and it doesn’t turn out that well. We agree to keep ourselves dry before getting back to the ship. So on the last 1 hour, we changed and walk around the Island. We spot our cruise ship docking not too far away from the shore and we continue walking along the beach, enjoying the surroundings. It was lovely. The beach was powdery white and there’s alot of shells so we need to be careful while walking. On the far end of the right side from the jetty, there’s a little area where you can have your great shots taken. It has a little natural backdrop with stones and rocks and it’s really great for photoshoots. By now we were both famished so we decided to get onto the first boat which will bring us back to the ship. Exhausted from snorkeling, both of us lay down on our own single bed and fall asleep for awhile. As soon as I got up, I get ready for dinner and the photoshoot I have been wanting to do. I told my friend exactly the angles I want. It took him a few tries. When he still couldn’t get the satisfied ones, I had him as my model and took a few shots and show him. It took him more shots because while the photo is great, the background is just a white shades, so after many tries, he finally got some few shots I like. Won’t be able to post photos of him because he request me to remove all his pictures. So, I respect his decision. This is one of my favourite photo up till today. I could still smile to myself, just reminiscing back to those moments. We had our dinner at Mediterranean Terrace today. The food are pretty good but because the restaurant was a little cold, the food gets cold easily. After dinner, we chill out at deck 12 for the ex to smoke while enjoying the sunset view as it leaves Pulau Redang. It wasn’t that gorgeous cause it seems a little too moody. But still, lovely. Then we head down to deck 7. I relax by the lounge and just look out into the dark sky and feel the night sea breeze. Very chilly indeed. Then came a woman, trying to sell us tickets to Nikita show. It cost about $60-$80 if I’m not wrong. I nearly bought it but we not to spend my money hastily. Instead, decided to go ahead with our ‘Somewhere In Time’ free show instead. While on the way to Lido to watch ‘Somewhere In Time‘ show that night, I saw a very beautiful vintage phone. Love it. As usual, before heading back to our cabin, since it’s our last night, we went back up to the Sun Deck to enjoy the last moment of our night on board this cruise. I tried the Rose part and it was really fun! No photos since the camera went dead. There were more stars tonight and the wind is even colder. We assumed that it might even rain later. As we explore the deck below, we saw a huge chess board and start jumping around. It was fun. We wanted to go karaoke earlier on but thankfully it was fully booked and we had to wait so we decided to pass. We walk around, sit, walk around again and sit and finally end the day with a heavy heart, knowing that when morning comes round, we’ll be in Singapore waters. I was woken up in the middle of the night after hearing a loud sound of thunder. I look out the window and realised that it was raining heavily. Yes, very heavy that the waves were stronger and I could feel the ship swayed. So our assumptions earlier on was indeed true. It rained. I try to get back to sleep but I can’t. So I did what I did the night before – Sit by the window and just look out at the waves hitting the ship and watch as the sky cry her hearts out. It was a sober night. I closed my eyes as I thank Allah for the opportunity and I fell asleep sitting by the window for a few minutes until another sound of thunder echo through the window I leaned on. I smile and get back to bed. And again, we miss the sunrise. It was still raining but it starts to slow down. After a heavy breakfast at Mediterranean Terrace, we went over to Port O’ Call and purchase souvenirs for our love ones. I wanted the landyard so badly but it was all sold out. 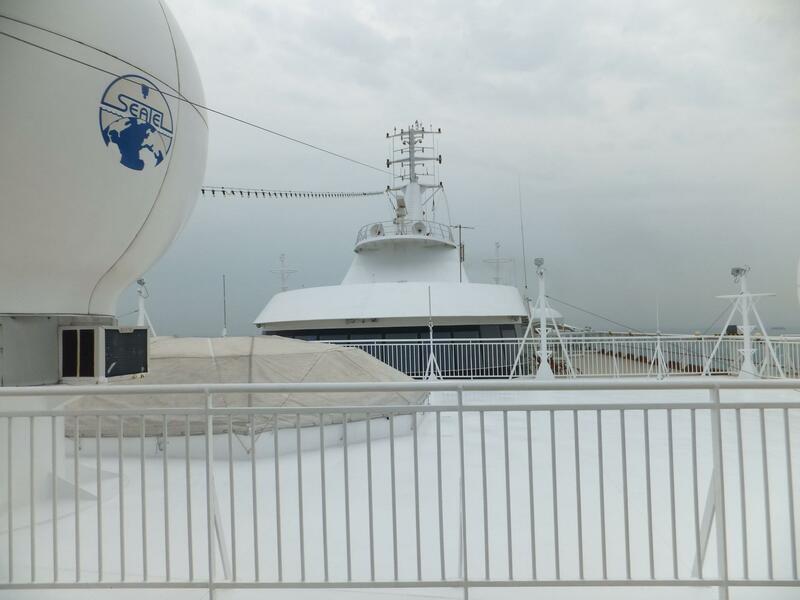 We are already in Singapore waters and East Coast view begin to get even clearer and the drizzle is getting lighter. I could see my Director’s condo, my working place from where I was. Somehow, I suddenly feel good to be back home, unlike the heavy feelings I had last night. Breakfast done, so we explore the ship one last time. This time heading out to View Point at Deck 8. The wind was dancing happily, making it lovely to be out here. The sun wasn’t that fierce too. So it was a great combination that makes it a perfect windy day. We were the first few to be at the view point and we stood there the whole time just enjoying the wind. Took my own shot of this. That feeling, it was such a wonderful feel that I can’t even describe it. Our 3d2n cruise experience has been really a once in a lifetime amazing trip for me. I had always wanted to be on a cruise and I still can’t believe that I got the chance to be there back then. Cruising trips are really expensive. But if you just want to have a very relaxing holiday where you can get to do everything at your convenience without the hassle of driving out, this is the place to be. Especially if you enjoy waking up in the middle of the Ocean. Everyone should experience this at least once in their lifetime if you got a chance to. You’ll never regret it, trust me. Just once is more than enough. Cruising is never boring because there’s alot of activities lined up for you and all you have to do is pick and choose the ones you want to join in. There are pilates, yoga, sports and many more for all adults and kids too! There’s childcare centre where the parents can leave their child safely in the hands of professional care takers. 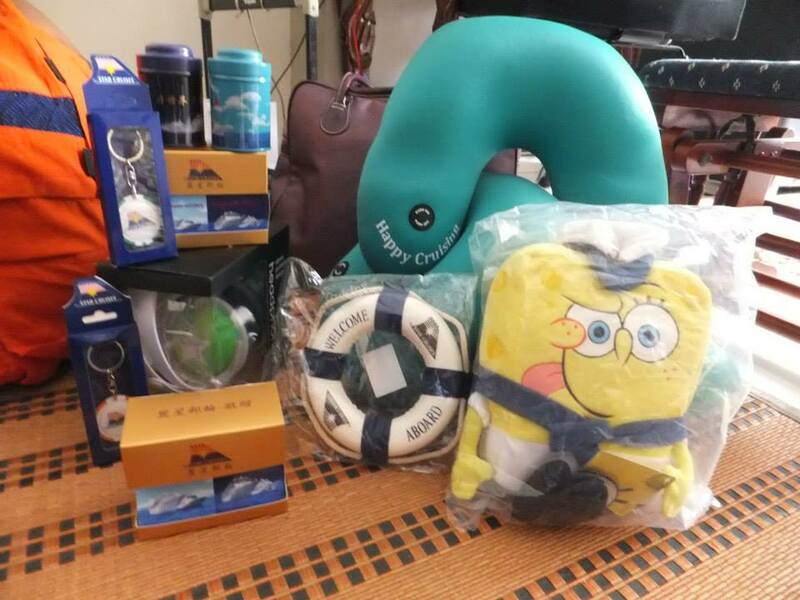 Here’s the souvenirs we got. I owe this great moment to dear friend who has given this trip to me. May God bless him always. Thank you. What a great experience for you. Great narrative and inviting images too. Thank you soo much! But honestly, after reading a few of my post, what do you think I can improve on? I haven’t been blogging long so I’m no expert however I’m of the view that if you write the way you feel and you words and style resonate with readers you are on the right track. Your images are interesting too and they can make or break a yarn. They must support the words and add interest to your narrative. Have a go with Blogging 101. You will learn a lot and have fun along the way.